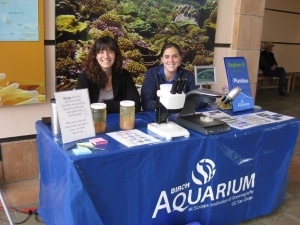 A unique collaboration has taken place recently between CCE-LTER graduate students and Birch Aquarium at Scripps. 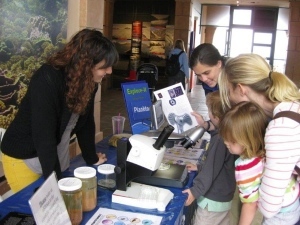 Twice a month these students join forces with aquarium educators to participate in a visitor-focused, hands-on activity called Explore It: Plankton. 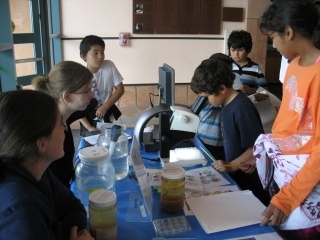 Birch Aquarium visitors are given the opportunity to “explore” the water around the Scripps Oceanography pier by using scientific tools, like microscopes, to observe live plankton samples. Through the visitor’s own observations and discussions with the facilitators they are introduced to how scientists collect and study plankton, the diversity that exists among them and its role and importance in all ocean ecosystems.